Dare Celtic slave Flavia trust her Roman master Marcus? Another shock, she thought. He spoke her language perfectly. Satisfied with the fire, he looked her up and down, studying her flyaway hair and wiry figure, her baggy, patched dress of undyed wool, one of the cook’s cast offs. She gasped as he took the broom from her. Flavia said nothing. If he underrated her, so much the better. Above all, let him not ask too many questions about the death of her beloved mistress. She tightened her grip on the broom and wished herself far away. She tried to lower her head but, quick as she was, Marcus was too fast, catching her chin in his hand. She stared into his dark blue eyes, hating herself for the tide of color that she could feel sweeping up her face. ‘Do you think I don't know?’ Horrified at her own free way of speaking, Flavia clamped her jaws so sharply together that her head seemed to ring. It was instead the sounds of the metal-workers’ shops beginning another day’s work, she realized. 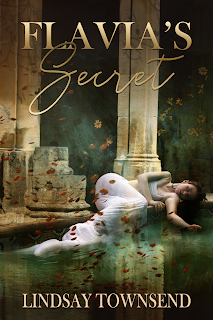 Around her, hidden by the walls of the town villa, Aquae Sulis was stirring into life. Again, he had surprised her. In the silence that fell between them, Flavia heard a young street trader in one of the alleyways begin his piping cry, ‘Sweet chestnuts, freshly roasted!’ She could hear the rumble of hand-carts and smell the aroma of freshly baked bread. All were signs of her city waking up. A day her mistress, the formidable yet generous Lady Valeria, would not see. Trying not to think of the old lady, Flavia looked up as Sulinus wandered past, dressed in his swathe of ragged cloaks—as many as the gardener could find in this frosty weather. A dark head blocked her view, a face in profile, gleaming in the red winter morning light like a cast of bronze, although no statue had such watchful eyes. ‘Have you people no proper clothes?’ Marcus muttered, a question Flavia knew she did not have to answer. She found herself watching his mouth: there was a small ragged scar close to his lower lip. His forearms carried several scars, the results of sword cuts in many skirmishes. A warrior, her senses warned, but even so, she was unprepared for his next question. ‘And where is your sweetheart in this city? An apprentice cobbler, perhaps? Or do you prefer someone with softer hands, another scribe like yourself? A desk man! ‘Follow me!’ he barked, and strode along the gravel path, his sandaled feet stamping through ice puddles. Flavia scrambled to keep pace with him. Whatever happened, she did not want him taking his ill temper out on Gaius or Agrippina or any of the others. These were all the family she had and she was determined no harm would come to them. No harm, especially, from what she had done. ‘Not all,’ Flavia said quickly. Her mistress had been writing or dictating letters to Marcus for the last four years, ever since the Lady Valeria had met the tribune on her single trip to Rome. Flavia had no idea why her mistress had made him her heir, but they regularly corresponded, especially in the last year after Marcus’ military career brought him to Britannia, to the northern city of Eboracum. Flavia had never seen the tribune until he rode down from the north in response to her own letter to him, informing him of the Lady Valeria’s sudden death. Now that she had met him, Flavia only knew that he made her uneasy in all kinds of ways. They had returned to the brazier and the statue. Flavia leaned her broom against the statue and began to tease away a strand of ivy from the squat marble figure. Marcus had not yet released her other hand. She was wary of that and of having to look at him. ‘Yes, sir,’ Flavia agreed, wishing that she did not blush so easily. They were coming to dangerous ground again, and she said nothing more. Flavia stole a glance at him, but his face was unreadable. ‘We were not separated. I lost them—when I was eight.’ Her voice faltered. Marcus crouched beside the statue so that he was looking up at her. ‘Go on,’ he said quietly. Marcus saw the change come over the small blonde slave. When he had first seen her, standing so grave and quiet beside the cremation pyre at the funeral of the Lady Valeria, she had reminded him, piercingly, of little Aurelia, his own daughter. Flavia had the same delicate appearance, the same golden tumble of hair, even down to the way it tended to curl by her ears. In these things she might have been a mirror of Aurelia, who was now dead. Little Aurelia and her mother both dead of fever in the wilderness of Germania, five years ago. The memory had almost overwhelmed him a moment ago, but he should not take out his grief on Flavia. He had thought her a soft house slave, as insubstantial as a water spirit, but her hands were toughened with years of work and she had endured loss. He could hear it in her voice. She would run well, Marcus thought. Her body—the little he could see under that patched gray shift—looked straight. Skinny, one part of his mind said, but then he had surprised himself by asking about her sweetheart. A crass inquiry. Marcus scowled and listened to the rest of her story. ‘I was sold when I was eight years old and the Lady Valeria bought me. She gave me a home, a new family. She taught me to read and write. I owe everything to her,’ Flavia said simply. He could hear her honesty, and something more. The girl was hiding something. Then he shrugged. Although his father owned slaves, this was the first time he had done so for himself and only because of Valeria’s inheritance. He felt uncomfortable with the whole business of slave ownership, especially a girl as young and pretty as this. What poor wretch of a slave did not have secrets? ‘Tell me your duties,’ he ordered. ‘I was my lady’s scribe and personal maid,’ Flavia answered crisply. Flavia ripped another strand of ivy from the statue. ‘If that is your wish.’ She whirled about and dropped the ivy onto the brazier so that her back was to Marcus Brucetus. ‘I talk to Gaius and Sulinus every day,’ Flavia shot back, a reply that made him laugh out loud. Behind her, Flavia could hear Marcus Brucetus tapping his face with his fingers. She clenched her teeth, part of her angry that her mistress had mentioned her, part of her alarmed. If the Lady Valeria had regularly added more than her signature to her letters before sealing them, what else had she told Marcus Brucetus? Please do not let harm come to the others, Flavia prayed. If she had done wrong, only she should pay. Marcus Brucetus cleared his throat. ‘A mettlesome little thing. May need watching. Valeria was a shrewd old bird, would you not say?’ Flavia remembered the Lady Valeria walking in this courtyard only a few weeks earlier, in a sunny day in late summer, when the roses were in bloom. Her mistress, who had once been as straight as a spear, had been forced to lean on Flavia’s arm and use a stick. She had complained vigorously. She had been an independent woman, the widow of a Roman knight. Her mother had been a British princess and Lady Valeria, tall and handsome in her youth, had become a learned and decisive woman. With her iron gray hair in its severe, old-fashioned bun, her plain green gowns, her penetrating brown eyes and her restless curiosity, Lady Valeria had displayed another kind of Celtic pride. She had fought the infirmities of age. Flavia never liked to hear her mistress speak in this way, but in the end Lady Valeria, proud Romano-British matron, had chosen a Roman death. Leaving her papers all in order and dressing in her richest gown and in her best jewels, Valeria had told her attendants to leave her alone in her study for the evening. There she had taken a draught of poison in a glass of her favorite wine and died, sitting in her wicker chair, her head supported comfortably by cushions. Flavia had found her the next morning. Remembering, Flavia shuddered. She had not cried since Lady Valeria died and she did not weep now, but every night since then she had come awake in the middle of darkness with the question, Why? on her lips. ‘It is a pity,’ Marcus Brucetus remarked. Restored to the present by his voice, Flavia blinked and turned to face him. Strangely, his presence tempered her grief, if only because she had to be wary of him. ‘What is, sir?’ she asked. ‘She did,’ Flavia agreed faintly. Lady Valeria had considered more than two baths a week to be wallowing in luxury, a sign of moral weakness. ‘Often in the darkest months she would speak of making her final journey to join her husband Petronius,’ Flavia found herself admitting. ‘Now she has done so—and we are the losers.’ Frowning, Marcus Brucetus watched a raven floating over the thatched and tiled roofs of the villas and shops. With a curse, he turned and strode over to the nearest of the four strips of garden that bordered the courtyard’s central marble statue. He snatched up a handful of earth, returned to the brazier and threw the frozen soil over the fire, instantly extinguishing the flames. He moved off, beckoning her to accompany him. Flavia’s spirits sank further when Marcus Brucetus led them straight through the villa to the small cozy room Lady Valeria had chosen to be her study. Closing the door, drawing the door curtain across, Marcus sat at her desk on the simple stool that Flavia had used in this room. Someone, possibly Marcus himself, had moved the wicker chair in which her mistress had died to the darkest corner of the room, a small mercy for which she was deeply grateful. There were no windows, but Marcus Brucetus lit an oil lamp, placing it on one end of the desk. He picked a stylus from the desk, then put it aside. ‘You found her here,’ he said, reaching for a jug and a cup, both of red Samian ware, both new to this house. ‘I did.’ As he poured a cupful of wine, Flavia wondered if she should have offered to serve him. Flavia looked hastily about the room. Aside from the wicker chair, which she would not use, there was only the blue and gold couch set against one of the plain plastered walls and the wolf skin rug in front of the desk. Lady Valeria had never permitted any of her servants, even Gaius who had been with her for twenty years, to sit on the couch. ‘Oh, she did, sir,’ Flavia said. ‘Her face, it was so calm.’ She stopped as Marcus held up a hand. Flavia shook her head. ‘What are you saying?’ she whispered. ‘Nothing.’ Marcus drained his cup and rose to his feet. ‘I suppose I cannot quite believe that she has gone. Wait here a moment.’ He walked past her and out of the room. Once she was alone, Flavia put her face in her hands and tried to take a deep breath. She knew that in the end, Lady Valeria had chosen her own path, a path which she would never take because her secret Christian faith forbade it. Although her mistress had never questioned her about her beliefs, Flavia guessed that the Lady Valeria had known that her young female scribe had been distressed each time she spoke of choosing death and so, in a final kindness, Lady Valeria had acted without telling her. That was what Flavia believed, which was why she had done what she had. Finding her mistress sitting peacefully at her desk, looking as if she had fallen asleep, Flavia had written a final message as if from Lady Valeria, faithfully copying the hand of her mistress. She had done this because only two days earlier Gaius had rushed in from the market, deeply distressed by a rumor going around Aquae Sulis that a nobleman had died in Rome in suspicious circumstances and that his entire household of slaves had been put to death. ‘They were all crucified!’ Gaius had shouted in the kitchen, his usually carefully combed-over hair falling into his staring eyes and his wrinkled, homely face bleached with distress. ‘Even the children!’ When she had embraced him to comfort him, Flavia had felt the old slave trembling. That remembered horror had remained with her, a goad and a warning that she must continue to be careful. Marcus Brucetus was a soldier, used to dealing in death. If he decided that he did not trust Lady Valeria’s servants, might he not be tempted to make a clean sweep of them? He was coming back; she could hear his quick firm tread on the floor tiles outside the study. Flavia let her hands drop by her sides and checked her appearance in the faintly distorting reflection of the metal tray which held the Samian wine jug. A pair of wide bright eyes, flushed forehead, cheekbones, and chin and trembling full mouth flashed into view before she stepped back onto the rug and straightened, ready to face him. ‘Read this.’ He thrust a piece of papyrus at her. She knew what it would be, but even braced for the shock, Flavia felt herself begin to sway. She blinked and her own writing swam back into view, her hand faking the Lady Valeria’s spare, spindly scrawl. A hasty letter, written in panic and in fear of the possible consequences should any kind of suspicion fall on the household. ‘Read it aloud,’ Marcus commanded, standing in front of her. ‘Get on with it,’ he growled. ‘I don't know why!’ Flavia tried to tear herself free, but even as his grip fell from her chin, Marcus clamped his arms around her middle. ‘No, you don't.’ He gave her a shake and, as Flavia’s hands automatically came up to fend off possible blows, he dragged her against himself, trapping her arms against his chest. Flavia closed her eyes, seeing Lady Valeria in the wicker chair, her eyes closed, one hand lying flat on her desk as if stretching for her stylus. That was what must have happened. That was why her mistress had left no note. At the sound of Marcus’ voice, Flavia started, suddenly becoming aware of him again, making her even more conscious of the gulf between them, free and not. He could do virtually what he liked to her, to any of the others, and nothing would stop him, least of all Roman law or morality. Flavia nodded, afraid to speak in case she broke down. For the hundredth time, she wished Lady Valeria had not done it. ‘If only she had spoken,’ she murmured. ‘I used to massage her with oils—she told me that they helped, that they eased the pain.’ She could not go on. ‘Indeed. In some ways, at least.’ His mouth quivered with suppressed amusement, but even as Flavia sagged slightly against him relieved that he was not angry, Marcus lowered his head. What else would I be doing? Flavia thought, but she stopped herself from saying it. She was still locked into his arms. ‘May I sit down?’ she asked, despising herself for asking, but wanting to be away from this disturbing man who remained a danger to her and to the rest of the household. Flavia walked stiffly round the desk and sat on the stool, her head high as she stared at him. ‘Comfortable?’ he asked, in mock solicitude. ‘Perfectly, thank you,’ Flavia answered, determined to show nothing, although her hands tingled with the desire to strike back. ‘Good! I like my people to be comfortable.’ Marcus began to pace across the wolf-skin rug, crossing the room from side to side. ‘You are listening?’ he asked a second time. ‘Yes, sir.’ Flavia found herself becoming apprehensive again. Her new master’s next words did nothing to dispel her sense of foreboding. ‘Yes, the differences in the hand-writing; I had forgotten those for the moment.’ A glib answer that convinced Flavia he had done no such thing. As she stared back at him, Marcus began to explain. The instant she spoke, she regretted the easy jibe, while at the same time being astonished at the words coming out of her mouth. She had never spoken this way to Lady Valeria, never so...freely? Risking a glance at Marcus, she saw him become dangerously still, the dark stubble on his chin defining his clenched jaw. Flavia’s hands bunched into fists on her lap, then realizing what she was doing, she jumped to her feet, the stool scraping on the floor tiles. Grinning, he turned and strolled from the room. Thanks, Linda! So do I!